1998. Amazing Spider-man 438, vol 1. (7 pages from 24 page story) Writer: Tom DeFalco. Artists: Scott Kolins, Gary Martin. The Spiderfan review is here. It calls this issue empty filler, and it is. The reboot is on it's way and everything is ramping up to John Byrne's epic reimagining of the Spider-man universe in Chapter One! The editors are barely paying attention to DeFalco's sneaky ongoing storyline about a missing May (but they did notice eventually, and changed it at the last minute to Aunt May). So...just another day in the life story. Synario, holographic illusionist, robbed a bank earlier despite Spider-man's best efforts. When the game company she's working for hires attorney Matt Murdock to secures rights away from the employees of all their work, she goes out and, in a rage, attacks the first hero she sees. The game company owner who so enraged Sinario has become suspicious! He attacks her in an effort to take her technology--after all, if she made it while working for the company, the rights to it belong to him! The Gathering of the Five story followed shortly after. Nov 1998. Kevin Smith starts Daredevil issue one, volume two! Joe Quesada on art! Nothing really changed. Kevin Smith thought they were still friends and wrote them that way. Jan 1999. Amazing Spider-man 1, vol 2. Writer: Howard Mackie. Artists: John Byrne, Rafael Kayanan, Scott Hanna, Jimmy Palmiotti. Everything is different! Peter Parker isn't Spider-man anymore! Aunt May isn't dead anymore! Peter isn't poor, because Mary Jane makes lots of money modeling, so they're living in a penthouse! And he finally gets a job working as a scientist! Where I give Byrne and Mackie props--they restore the neglected friendship between Peter and the Human Torch. This issue has a nice reminder that these two also used to meet regularly and have a 'spot' that's theirs. If you didn't think they were friends, the Torch leaves a message written across the sky of New York in flaming letters to let everyone know. But Daredevil is treated as just a colleague. From Fantastic Four 243, vol 1. Writer: John Byrne. Artist: John Byrne. June 1982. There's a very nice Fantastic Four appearance in Amazing Spider-man 4, vol 2., as well. Meantime, the previously nearly idyllic period for Daredevil came to a close when his longtime girlfriend, Karen Page, is killed by Bullseye. Mysterio wove an apocalyptic scenario that nearly convinced a drugged Daredevil to kill a baby, believing it was the Anti-Christ. At the end of the story, after a truly vicious critique by Daredevil, Mysterio seems to kill himself. While the character--or someone pretending to be him--came back later, he never dared trouble Daredevil again. April 1999. 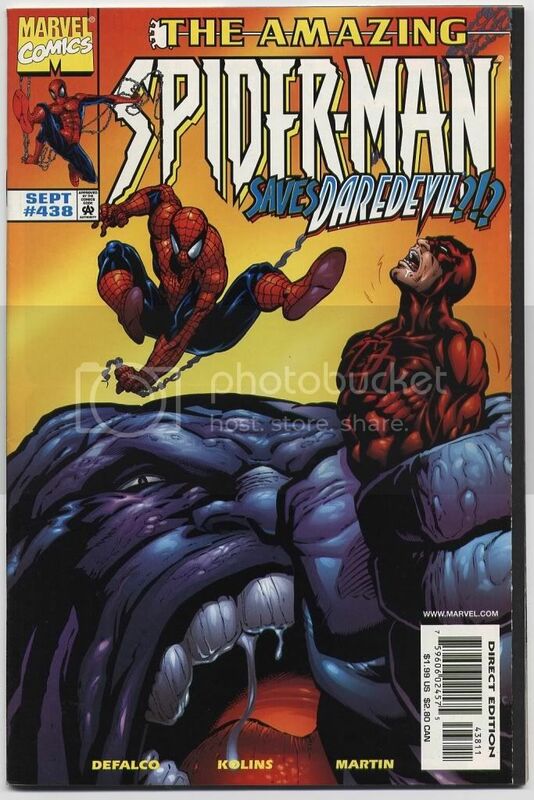 Daredevil 8, vol 2. (4 and a half pages) Writer: Kevin Smith. Artist: Joe Quesada. Peter and Mary Jane react to the news about Mysterio, while getting ready to go to Karen Page's funeral. Whyyy is their usual place the Brooklyn Bridge? May 2001. Daredevil: Ninja 3. Writer: Brian Bendis. Artists: Rob Haynes, David Self. An interesting addendum to the story of the baby from Kevin Smith's first arc appears in the 3-issue mini Daredevil: Ninja. In it, Matt discovers that his old mentor, Stick, was the reincarnation of an ancient hero of Japan, Yamato-Takeru, who wielded a sword nicknamed 'Grasscutter' that had a legendary importance similar to Excaliber with Britain. The Hand and the Chaste (Stick's group) have been warring over who gets to control the soul of the wielder and the sword (according to Real Life, it's in the Japanese emperor's regalia). 'Stick' was a joking reference to the sword. Stick's old staff, formerly held in sword stand, is stolen and replaced with Daredevil's blind man's cane (which is secretly a weapon). The story is confusing and full of lies, betrayals, and in the end after a clash between Hand and Chaste at the airport, Matt is left standing alone, wondering what happened. Here he's looking at his memorial wall. In the issue's epilogue, the Chaste manages to get control of Stick's new incarnation. 'He' is a now a baby girl, named Karen. Joe Q continues to be a odd artist. Is it me, or does Peter look like a young, brown haired ELVIS in one panel?! Actually, Matt, you're trying to "dam" the "torrent of injustice and death" that threatens to drown you every day, not "damn" it. Granted, if you're hanging out with someone who made a deal with the devil, it's only natural that damnation would be on your mind, but the extended metaphor works better the other way. Maybe he is trying to damn the torrent of injustice and death. Matt might not be too bright. Why was Clark Kent reporting Mysterio's death? Maybe it's just me, but I personally find the whole 'Robo-Devil' sequence to be hilarious. 'Help me - please! This killer-droid is trying to slaughter me!' 'Excuse me...? Are you all right, ma'am?' It's the visuals that make it. Also - wow. THAT is what I call being depressed. And here begins the emo!Matt. When I said 'happy deconstruction day', I may have been sarcastic. I'm pretty sure the actual Grasscutter was... stolen and thrown into the ocean and never recovered. I'm just not sure what time period that was. It was the outcome of losing a war. Only one of the Three Relics has a chance of being real, and the sword isn't it. When the internet comes up with too many options as to what REALLY happened to the sword, I tend to not trust it. In the Marvel U, it was probably in the control of the Hand. I love the Robo-Devil issue just for the "trust in your heart" scene. But he makes a cute robot! So let's see...instead of say, looking out for innocent bystanders, helping the police and the fire departments, etc. Spider-Man and Daredevil instead decide to get a barrel of popcorn and watch Galactus fight the Fantastic Four and the Avengers? No wonder the citizens of the Marvel Universe hate superheroes. (sorry, that just stuck in my craw...even if the threat is more than they can handle, they could be helping out in some way, shape or form). One suspects the answer to both our queries about frustrating characterization is..Byrne. See, I like Byrne. I think he's an extremely capable writer and he's done a lot of stuff that I really enjoy. That said, every once in a while he'll toss something in--like this--that makes you wonder what he's thinking about. What in the Hell happened after the end of the 20th Century, anyway? Kevin Smith USED to be GOOD. A good writer, a decent director...and not just him, either. I mean, Quesada used to be an excellent artist and not a swear word used by Spider-Man fans worldwide; Judd Winick and James Robinson were able to make compelling stories with well-conceived characters that didn't rely on brutality and shock value to sell issues. Hell, at the risk of bringing down the wrath of this place, I'm finding myself longing for the geek continuity masturbation of Kurt Busiek and Mark Waid and Peter David even...when did being horrible become the status quo?